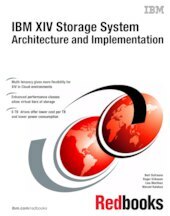 This IBM® Redbooks® publication describes the concepts, architecture, and implementation of the IBM XIV® Storage System. The XIV Storage System is a scalable enterprise storage system that is based on a grid array of hardware components. It can attach to both Fibre Channel Protocol (FCP) and IP network Small Computer System Interface (iSCSI) capable hosts. This system is a good fit for clients who want to be able to grow capacity without managing multiple tiers of storage. The XIV Storage System is suited for mixed or random access workloads, including online transaction processing, video streamings, images, email, and emerging workload areas, such as Web 2.0 and cloud storage. The focus of this edition is on the XIV Gen3 running Version 11.5.x of the XIV system software, which brings enhanced value for the XIV Storage System in cloud environments. It offers multitenancy support, VMware vCloud Suite integration, more discrete performance classes, and RESTful API enhancements that expand cloud automation integration. Version 11.5 introduces support for three-site mirroring to provide high availability and disaster recovery. It also enables capacity planning through the Hyper-Scale Manager, mobile push notifications for real-time alerts, and enhanced security. Version 11.5.1 supports 6TB drives and VMware vSphere Virtual Volumes (VVOL). In the first few chapters of this book, we describe many of the unique and powerful concepts that form the basis of the XIV Storage System logical and physical architecture. We explain how the system eliminates direct dependencies between the hardware elements and the software that governs the system. In subsequent chapters, we explain the planning and preparation tasks that are required to deploy the system in your environment by using the intuitive yet powerful XIV Storage Manager GUI or the XIV command-line interface. We also describe the performance characteristics of the XIV Storage System and present options for alerting and monitoring, including enhanced secure remote support. This book is for IT professionals who want an understanding of the XIV Storage System. It is also for readers who need detailed advice on how to configure and use the system.